On April 11th after President Obama’s speech that was discussed in a prior post, President Castro delivered his major Summit speech, most of which was a critical review of the history of U.S. relations with Cuba and other Latin American countries. This post contains substantial extracts from Castro’s speech. Other posts will examine the two presidents’ subsequent private meeting at the Summit plus Obama’s comments on other subjects and the reactions from other leaders. A major section of the Castro speech covered Cuba’s continued advocacy for the ideals of the Revolution, for true international governance of the Internet, for changes in hemispheric relations and cooperation against cyber warfare, climate change, terrorism, drug-trafficking organized crime and inequality and for eradication of poverty, illiteracy and hunger. He also commended the efforts in these areas of CELAC [Community of Latin American and Caribbean States], UNASUR [Union of South American Nations], CARICOM [Caribbean Community], MERCOSUR [Southern Common Market], ALBA-TCP [Bolivarian Alliance of the Peoples of Our America—Peoples’ Trade Treaty], SICA [System for Integration of Central America] and ACS [Association of Caribbean States]. It would be easy to criticize this speech as an unnecessary historical review going back to the late 19th century and as an unproductive way to advance the cause of Cuba-U.S. reconciliation in 2015. On the other hand, I see the speech as a necessary recital to the U.S., other countries in the hemisphere and the world of the reasons for Cuba’s historical and current suspicions of U.S. motives and actions and for Cuba’s wariness in engaging in the current negotiations for restoration of normal relations with the U.S. Nevertheless, this history is not preventing Cuba ifrom engaging in those negotiations, and by its actions Cuba is demonstrating that such reconciliation is in Cuba’s national interest. 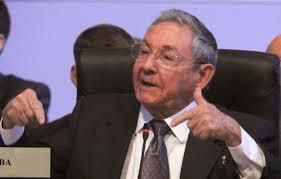 It is true what Raul Castro said about the timing of President Kennedy’s assassination. At that very same time and day of Kennedy’s assassination an emissary, journalist Jean Daniel, secretively sent by Kennedy to Fidel Castro, was communicating Kennedy’s message of opening a dialogue for peace with Cuba and normalizing relations, in a face to face meeting at Veradero, Cuba. It was secret because the CIA and US military command, as well as military industry “cold war” advocates, were determined to defeat communism, even if it meant a nuclear war, which they were convinced the US would prevail because of it’s strategic advantage and they saw any peace dialogue with Castro or Khrushchev as failure and treasonous. After the near fatal standoff of the October Missile Crisis with the Soviet Union, over nuclear missiles based in Cuba to prevent a planned US military invasion of the island, Kennedy and Khrushchev saw the madness of the implementation of the nuclear war policy on both sides and began talks also secretively to deescalate the arms race starting with the Atmospheric Test Ban Treaty. Weeks before Nov. 1963, a team of agents from Miami affiliated with the CIA and the failed Bay of Pigs invasion were organized by CIA deputies to carry out the assassination of President Kennedy. They traveled together from Miami to Dallas with the knowledge that certain precautions were being taken to allow them access to a site for the execution of the plan as well as a assassin decoy and cover that would hide the operation from public, media and government view and direct blame to the Soviet Union and/or Cuba. When Vice President Johnson assumed Presidential duties he put a halt to the behind the scenes overtures from Castro for a peace dialogue. He created a commission to be headed by Allan Dulles, the CIA Director President Kennedy had fired because of Dulles’ actions and deceit regarding the Bay of Pigs Invasion and trying to convince the President to order direct US military involvement in the operation so that it would be successful, to investigate the assassination of the President. Source, JFK and The Unspeakable: Why He Died and Why It Matters by James W. Douglass, Touchstone Press. of I do not know whether the allegation of CIA involvement in the assassination of President Kennedy is true. The commentator does cite to a book that, he asserts, supports his allegation, but a rigorous examination of the evidence cited in that book and of the many books about that assassination would have to be conducted in order to validate that allegation.